Personal exhibition of Orif Muinov, "The Road to the Woman' Soul", was timed to the 60th anniversary of the master, whose work is multifaceted and diverse. Yet he gives preference to the genre of historical portrait, turning to the characters of the country's renowned people - statesmen, national heroes and women-poets of the past. With skill, the artist pictures the depth, high poeticism and subtlety of these spiritual female images. The country's stage designers and theatre artists displayed their works at "The Scene-Fest. Doomed to Creativity" exhibition held as part of the First International Theatre Festival "UZ/2010". Masters of the older generation Vasiliy Yuriev and Boboniyaz Kurbanov, their junior colleagues, artists Davron Rajabov and Shukhrat Abdumalikov, young set designers Anastasia Chaplenko, Tatiana Fadeeva and many others have provided sketches, models and set design elements, as well as paintings and photographs dedicated to theatre and the characters of well-known plays. International Photo Biennale "TashkentAle 2010", the opening event of the Art Week "Style.Uz 2010", was the fifth anniversary show of the best works of photography artists from all over the world. It was organized by the Academy of Arts of Uzbekistan, "Forum for Culture and Arts of Uzbekistan" Foundation, and the Tashkent House of Photography. The Biennale Organizing Committee received about 2000 art photographs from 174 professional and amateur photographers from 43 countries, of which more than 800 pictures were chosen to be displayed at the FAGU, THP, CEH, the State Museum of Arts of Uzbekistan and the International Caravanserai of Culture. The personal exhibition of the famous Italian artist Marco Perego, organized as part of the Art Week "Style.Uz 2010", was a notable event in the art life of Tashkent. Marco Perego was born in 1979 in Brescia (Italy); presently, he lives and works in New York. Prior to becoming an artist and sculptor, he was a professional footballer, the best defence player in the Venice team. But life at times can be full of surprises... Perego is known for his eccentric, non-conformist paintings. The world learned about him after he had built a giant iPod displayed in Manhattan in front of the Apple store. Perego's works can be found in the collections of the world's famous connoisseurs of art. Personal exhibitions of the artist were held in the USA, Italy, UK, and now in Uzbekistan. "Poem about Uzbekistan", the first personal exhibition of HH Maha Chakri Sirindhorn, the Princess of Thailand, was organized as part of the TashkentAle. 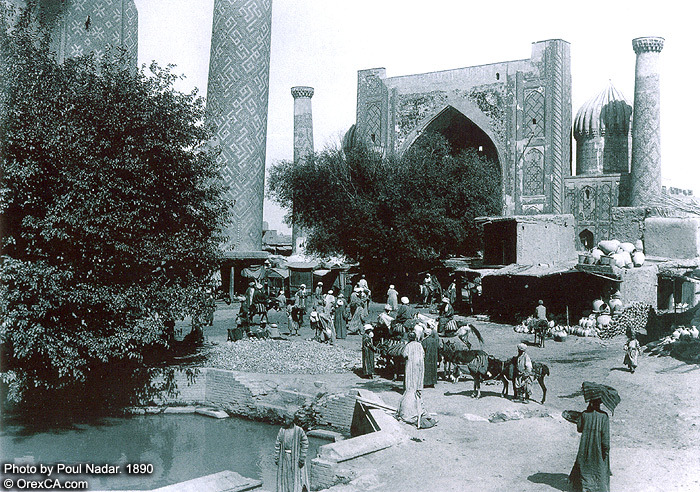 Her impressions of the ancient and unique cities of Uzbekistan, Samarqand and Bukhara, the Princess reflected in her numerous photographs. This project has once again demonstrated the interest of people from any country anywhere in the world towards the land of Uzbekistan and its monuments. The exhibition of young creatively thinking artists, "Aristotle's Riddle", was organized by the "Forum for Culture and Arts of Uzbekistan" Foundation and the Academy of Arts of Uzbekistan as part of the Art Week "Style.Uz 2010". The project objective is to encourage the young generation of the country's artists to develop their ability for a non-conventional worldview and interpretation of reality, as well as capacity for finding original solutions to artistic problems. This would allow an objective assessment of their creative potential and the degree of post-modernist views development in the national art. "The Melodies of Bukhara" was the title of a personal exhibition of Bukhara artist Erkin Juraev dedicated to his 50th anniversary. More than 90 works, including paintings, drawings, sketches for theatrical productions, and puppets he made while working in Bukhara Puppet Theatre - were all brought together in one large series telling us about the artist's hometown and the people living in it. The artist who has a perfect knowledge and keen sense of traditions, customs and lifestyle peculiarities of Bukhara, carefully paints traditional household items, clothing and dress accessories etc. He lovingly treats people who are the main characters of his paintings. The first exhibition held in the Azerbaijan Cultural Centre that was opened during the official visit of Ilham Aliev, the President of Azerbaijan, to Uzbekistan in September 2010 was the exhibition of works by Azerbaijani sculptor Einulla Aliev. The laureate of the State Award of Uzbekistan, member of the Creative Union of the AAU, Aliev has made a significant contribution to the development of fine arts in Uzbekistan and participated in numerous exhibitions. As part of the group of authors, the sculptor took part in creating the monument to the prominent Uzbek poet Alisher Navoi now installed in the National park of Tashkent, and in decorating two subway stations in Tashkent and numerous buildings of public and academic institutions in Tashkent, Samarqand, Bukhara, Nukus and other cities. His works made of stone, copper, bronze and wood presented at the exhibition are only part of the unique heritage of this remarkable sculptor. These items were prepared for the display by the AAU and the master's daughter Yagut Alieva who continues her father's work. Photo exhibition "Paul Nadar. From Turkey to Turkestan. 1890" became the highlights of one of the central halls in the House of Photography. Its organizers - the AAU, the "Forum for Culture and Arts of Uzbekistan" Foundation, the Embassy of France and the French Cultural Centre - provided the Tashkent audience with a rare opportunity to get acquainted with the art of the wonderful French photographer who travelled in Central Asia 120 years ago. 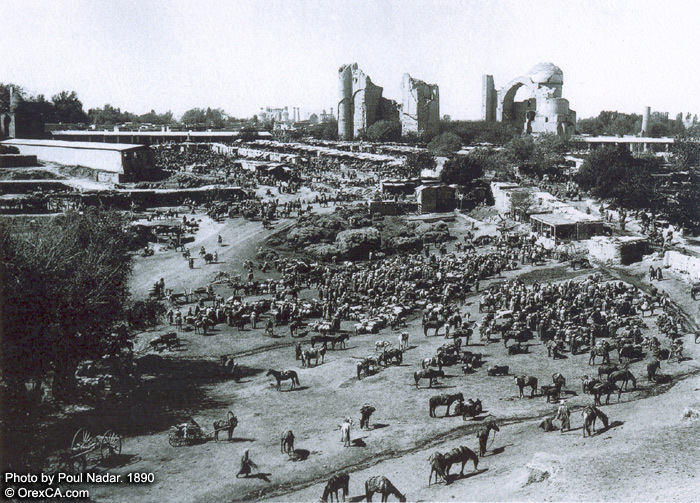 70 photographs produced with modern printing methods from original negatives stored in photo archives of the Ministry of Culture of France capture architectural monuments, squares and bazaars of Samarqand, Bukhara and other Turkestan cities, as well as scenes from the life of Uzbek people. Chairman of the AAU Tursunali Kuziev and the Ambassador of France to Uzbekistan Francois Gautier, speaking at the opening ceremony, noted that the exhibition was not only an event of documentary and aesthetic interest, but also facilitated the expansion of cultural dialogue between France and Uzbekistan. The personal exhibition of artist Alexander Tyurin, "Dialogue", dedicated to his 50th anniversary displayed 90 paintings. Original artistic vision and performance, broad outlook, fine artistic taste and skill are the distinctive features of his art. Studying the world's best traditions of old Russian, classical European, realistic and contemporary art and paying tribute to them, the artist creates pieces such as his "Italian Series", paintings on biblical subjects, and modern conceptual works. Tursunali Kuziev, Chairman of the Academy of Arts of Uzbekistan, met with Ambroise Perrin, Head of the European Citizens' Commission on Central Asia, a famous artist and publisher of literature on art, who arrived in Uzbekistan as member of the European Parliament delegation. During the meeting the parties discussed the prospects of cooperation in the domain of arts and culture. Dr. Perrin spoke highly about pictorial art standards in Uzbekistan and stressed the need for more extensive introduction of the European and global community to the rich culture of the ancient land of Uzbekistan. A retrospective personal exhibition of Y. Zor'kin, "Awakening", displayed more than 100 works - easel paintings, drawings and watercolours created in different years. The artist dedicated many of his works to cities and villages of Uzbekistan, to the country's history and folk art, its landscapes and people with whom his entire life has been closely connected: his student years, his evolution as an artist, his family… Many of his works have become classical specimens of Uzbekistan's painting school. "The 59th Viewing" - this is the unusual title of the personal exhibition of Diyor Razikov, one of the younger generation artists working in the domain of actual art in Uzbekistan. Original manner and daring innovativeness distinguish his 18 displayed items, including conceptual canvases and art objects. "The 59th Viewing" is the first personal exhibition of the artist, showing the results of his creative work over the past ten years. The GTZ Office hosted the award ceremony for the winners of the young artists' contest organized and run between September 27 and November 1, 2010 by the German Agency for Technical Cooperation (GTZ), supported by the Academy of Arts of Uzbekistan. The contestants were the students and graduates of art colleges and the Behzad National Institute of Arts and Design, who pictured in their works the way people live in rural areas and the importance of education for them. The exhibition of a well-known Uzbek artist Andrei Krikis (1950-1994), who lived and worked in Tashkent and Samarqand, presented his legacy - paintings reflecting his vision of the world that is so peculiar, unique and often dramatic; these paintings now belong to the Golden Asset collection of Uzbekistan's fine arts. The exhibition was organized by the Samarqand branch of the Creative Union of Artists of Uzbekistan. The "Forum +" exhibition has become another "report" of the arts and crafts section of the Creative Union of Artists of the AAU for the 2010 season, now with a focus on ceramics. The skill of creating shape and volume that communicate with surrounding space was demonstrated by the artists already known in the field of contemporary decorative plastics, glazed ceramics and small sculpture, as well as by the younger members of the section. In addition to ceramics, the exhibition also displayed porcelain items, decorative straw panels and embroidery pictures. The first personal exhibition, "Wrong GAMES…", of the Tashkent artist Inna Sandler, demonstrated about 40 paintings and drawings. This exhibition is an attempt to take a closer look at a complex, controversial and unique inner world of the individual. …To look beyond the portrait where the notions of space, time and internal dynamics depend on the different shades of our emotions, thoughts and experiences. Sandler has been working quite a lot in the domain of book graphics, at the same time engaging in design development for many companies and organizations. Paintings displayed at the exhibition stand out in their originality and confident drawing. The 2010 exhibition of children's drawings as part of the "Japan through the Children's Eyes" contest was held for the second time. It was organized by Soka University in Japan, the AAU, and the Republican specialized boarding art school. Children's drawings are dedicated to Japanese culture and the country's traditional sports games and lifestyle. The display of the eighth reporting exhibition of the "Photo-Debut" creative photography studio graduates, most of whom are young people, showed about one hundred works. The objective of the exhibition is to show the diversity of forms in photography, the originality of stylistic approaches, and rich conceptual content of the works. The exhibition presented the works of Zamira Zarifbaeva, Alisher Kazakbaev, Dina Mussina and Alexander Gavrilenko, depicting natural landscapes of their homeland, architectural monuments and the life of their age peers. The exhibition of the already traditional project, "The Sisters' Remake", showed the works of the Vietnamese artist Nguyen Thi Hien and the Uzbek artist Ashuroi Adizova. The exhibition was organized by the Uzbekistan-Vietnam Friendship Society, the Ministry of Foreign Affairs of the Republic of Uzbekistan, the Creative Union of Artists of Uzbekistan, and Navoi Province Khokimiyat. The Republican show-contest, "The Skull-Caps of Uzbekistan", presented the works of women-masters - schoolgirls and college students, as well as women from mahallas, whose skull-caps had been recognized as the best in the preliminary stages of the competition. Participants also turned out to be wonderful singers and dancers. The show was organized by the Ministry of Culture and Sports, the Ministry of Higher and Secondary Vocational Education, the Tashkent City Khokimiyat, with the engagement of the Women's Committee of Uzbekistan. The third International Biennale of Children's drawings, "The Joys of Tashkent", presented over 3000 works of children from 5 to 15 years old from 41 countries. The main themes of the contest were "The Childhood World", "My Homeland", "The World I live in", "My Dream", and "Uzbekistan which I Know". Among the participants were also students from orphanages and educational institutions for children with physical disabilities. The event was organized by the AAU with support from the Ministries of: Foreign Affairs of the Republic of Uzbekistan; Public Education; Culture and Sports; Higher and Secondary Vocational Education; "Forum for Culture and Arts of Uzbekistan" Foundation, and others. The objective of the biennale is to give young talents the opportunity to perform on the international artistic arena, to help them choose their career path in arts, expand their outlook and increase the knowledge about their native land. The Jury has awarded the Biennale's Grand Prix to Arai Hiromi (Japan). Gold medals went to Zhannat Uzemedova (Turkmenistan), Maria Dudnik (Ukraine), Chi Wang (China), Alina Faizieva (Uzbekistan), Sharifa Ismoil Keyanna (Indonesia), Ahmad Mahmoud Muhammad (Egypt), and Anna Masarykova (Czech Republic). The exhibition "Uzbekistan, Our Motherland", dedicated to the 18th anniversary of the Constitution of the Republic of Uzbekistan, presented about 50 works of local photographers and photo journalists; most of them are the winners of national and international photography exhibitions and contests. Among the works are photographs by renowned masters, such as Rustam Shagaev, Farhad Kurbanbaev, Rustam Sharipov, Vladimir Sokolov, Konstantin Minaichenko, Vladimir Shlosberg, Timur Kurbanbaev, Anvar Hojiniyazov et al. "Space for Happiness" - this was the title of a personal exhibition of monumental painting artist Vladimir Ivanovich Chub. The exhibition scheduled to mark his 70th anniversary presented more than two hundred works from the artist's studio and the assets of the Art Exhibitions Directorate and the State Fine Arts Museum of Uzbekistan. Social and spiritual vector, painting and abstractions are the artistic credo of the master.